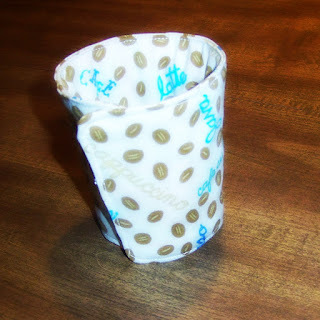 Carolina Peach Boutique: Coffee Sleeve Anyone? I don't know about anyone else, but I can't stand those cardboard coffee sleeves that some of the coffee shops offer. For one, they don't really protect your hands from the heat of the coffee well and then they just add to trash pileup. I found this coffee fabric when I was on our family trip in June to Colorado and just knew that I had to make some coffee sleeves! As you can see, it took me a little while to finally get around to making some, but here you have them. Beautiful brown fabric with coffee beans and various names of coffee types and coffee snacks. This makes a great gift for the coffee drinker in your life! Now that I got these done, I have some other material to use to make more: democrat and republican material to show your political pride! I hope to have these listed by mid month. Current Coffee Sleeves are on sale now in my Artfire and Etsy shops, go take a look. Those are so adorable! Stopping by from SITS, happy Thursday to you. So cute! I wish I could sew!